General Appearance:low-set, strong, sturdily built and active, giving an impression of substance and stamina in a small space. Should not be so low and heavy-boned as to appear coarse or overdone, nor so light-boned as to appear racy. Outlook bold, but kindly. Expression intelligent and interested. Never nervous nor aggressive. Head:the head should be foxy in shape and appearance. Expression: intelligent and interested, but not sly. Skull:should be fairly wide and flat between the ears. Moderate amount of stop. Very slight rounding of cheek, not filled in below the eyes, as foreface should be nicely chiseled to give a somewhat tapered muzzle. Distance from occiput to center of stop to be greater than the distance from stop to nose tip, the proportion being five parts of total distance for the skull and three parts for the foreface. Muzzle slightly tapering. Nose black. Eyes:oval, medium in size, not round, nor protruding, nor deepset and piglike. Set somewhat obliquely. Variations of brown in harmony with coat color. Eye rims dark, preferably black. Ears:erect, firm, and of medium size, tapering slightly to a rounded point. Ears are mobile, and react sensitively to sounds. A line drawn from the nose tip through the eyes to the ear tips, and across, should form an approximate equilateral triangle. Bat ears, small catlike ears, overly large weak ears, ears carried too high or too low, are undesirable. Button, rose or drop ears are very serious faults. Mouth:scissors bite, the inner side of the upper incisors touching the outer side of the lower incisors. Level bite is acceptable. Overshot or undershot bite is a very serious fault. Lips:black, tight with little or no fullness. Neck:fairly long. Of sufficient length to provide over-all balance of the dog. Slightly arched, clean and blending well into the shoulders. A very short neck giving a stuffy appearance and a long, thin or ewe neck are faulty. Topline:firm and level, neither riding up to nor falling away at the croup. A slight depression behind the shoulders caused by heavier neck coat meeting the shorter body coat is permissible. Body:rib cage should be well sprung, slightly egg-shaped and moderately long. Deep chest, well let down between the forelegs. Exaggerated lowness interferes with the desired freedom of movement and should be penalized. Viewed from above, the body should taper slightly to end of loin. Loin short. Round or flat rib cage, lack of brisket, extreme length or cobbiness, are undesirable. Tail--Docked as short as possible without being indented. Occasionally a puppy is born with a natural dock, which if sufficiently short, is acceptable. Undocked: set inline with topline. Natural carriage above topline when moving or alert. Legs--Short, forearms turned slightly inward, with the distance between wrists less than between the shoulder joints, so that the front does not appear absolutely straight. Ample bone carried right down into the feet. Pasterns firm and nearly straight when viewed from the side. Weak pasterns and knuckling over are serious faults. Shoulder blades long and well laid back along the rib cage. Upper arms nearly equal in length to shoulder blades. Elbows parallel to the body, not prominent, and well set back to allow a line perpendicular to the ground to be drawn from tip of the shoulder blade through to elbow. Feet--Oval, with the two center toes slightly in advance of the two outer ones. Turning neither in nor out. Pads strong and feet arched. Nails short. Dewclaws on both forelegs and hindlegs usually removed. Too round, long and narrow, or splayed feet are faulty. Hindquarters: ample bone, strong and flexible, moderately angulated at stifle and hock. Thighs should be well muscled. Hocks short, parallel, and when viewed from the side are perpendicular to the ground. Barrel hocks or cowhocks are most objectionable. Slipped or double-jointed hocks are very faulty. Feet--as in front. Coat:medium length; short, thick, weather- resistant undercoat with a coarser, longer outer coat. Over-all length varies, with slightly thicker and longer ruff around the neck, chest and on the shoulders. The body coat lies flat. Hair is slightly longer on back of forelegs and underparts and somewhat fuller and longer on rear of hindquarters. The coat is preferably straight, but some waviness is permitted. This breed has a shedding coat, and seasonal lack of undercoat should not be too severely penalized, providing the hair is glossy, healthy and well groomed. A wiry, tightly marcelled coat is very faulty, as is an overly short, smooth and thin coat. Very Serious Fault--Fluffies--a coat of extreme length with exaggerated feathering on ears, chest, legs and feet, underparts and hindquarters. Trimming such a coat does not make it any more acceptable. 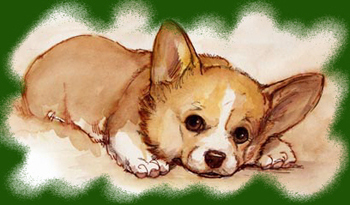 The Corgi should be shown in its natural condition. Colour:the outer coat is to be of self colors in red, sable, fawn, black and tan with or without white markings. White is acceptable on legs, chest, neck (either in part or as a collar), muzzle, underparts and as a narrow blaze on head. Very Serious Faults: Whitelies--Body color white, with red or dark markings. Bluies--Colored portions of the coat have a distinct bluish or smoky cast. This coloring is associated with extremely light or blue eyes, liver or gray eye rims, nose and lip pigment. Mismarks--Self colors with any area of white on the back between withers and tail, on sides between elbows and back of hindquarters, or on ears. Black with white markings and no tan present. Gait:free and smooth. Forelegs should reach well forward without too much lift, in unison with the driving action of the hind legs. The correct shoulder assembly and well-fitted elbows allow a long, free stride in front. Viewed from the front, legs do not move in exact parallel planes, but incline slightly inward to compensate for shortness of leg and width of chest. Hind legs should drive well under the body and move on a line with the forelegs, with hocks turning neither in nor out. Feet must travel parallel to the line of motion with no tendency to swing out, cross over or interfere with each other. Short, choppy movement, rolling or high-stepping gait, close or overly wide coming or going, are incorrect. This is a herding dog, which must have the agility, freedom of movement, and endurance to do the work for which he was developed. Temperament: outlook bold, but kindly. Never vicious nor aggressive. Faults:any departure from the foregoing points should be considered a fault and the seriousness with which the fault should be regarded should be in exact proportion to its degree. Note:male animals should have two apparently normal testicles fully descended in to the scrotum.